The first in a fast-paced, funny series featuring The Stig: Top Gear's legendary racing driver. A local boy, Buster Mustang, has recently gone missing, and no one seems to care - they're all too busy playing the highly addictive video game Xenon or getting the town ready for its very first TT race. Both are 5the brainchild of mysterious local billionaire PT Cruiser. Sam sets out with his new friends Minnie Cooper and Ford Harrison to uncover the truth behind all the strange goings-on in Bunsfold - but danger has a habit of showing up wherever they do, and soon all that stands between our heroes and disaster is ... a taciturn man in a white suit. So this time my step son William gets to share his thoughts on this new book! I really enjoyed reading this book. I'm not a huge fan of cars but the book had funny jokes in, even some jokes that Hanny and Daddy found funny! I didn't have a favourite character, Sam was cool though and I really liked that there was a girl in the story too because girls like cars too. 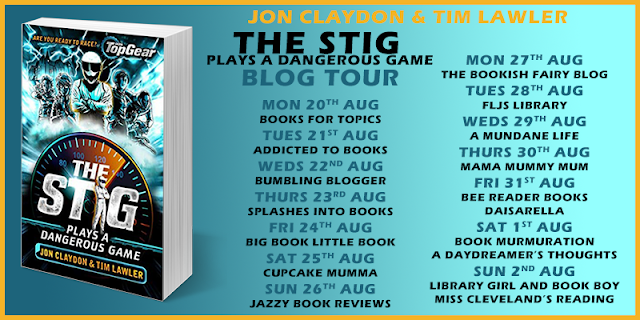 I'm going to give The Stig Plays A Dangerous Game a 4 out of 5 stars. Will and I read this together and he's right, there were some good jokes, a couple that went over his head too which I liked! Like Will, I was pleased to have some female characters in the story. 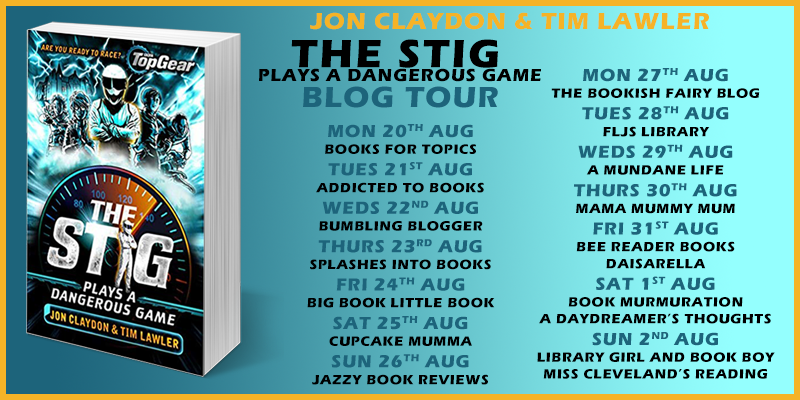 Check out the other bloggers on this book tour! The picture looks kinda scary for a childrens book. Though I confess, I'm never around kids these days to know what they read. I suppose it does like this! Up close though it's not so bad and it's aimed more for the 10 and over. Be interested to know if they think so though!